I love my camera gear almost as much as I love my children. Well I guess I’m prone to overstatement, but you get the idea that I love my gear. When you have such affection for the tools of a hobby you’re passionate about, you want to protect them; stylishly. Lei Momi camera bags for women allow you to snap away in style with its perfectly-sized bags. I was thrilled to try out the Lei Momi Alice in Mustard and was thrilled to discover its go-anywhere personality. Because all bags have personalities you know, and you either get along with them or you don’t. The Alice is sweet to look at in that old-style satchel kind of way, nice and compact for those who don’t like a cavernous bag. It has four padded, removable dividers, loads of pockets, a crossbody strap, padded walls and base with metal feet. So what can the Alice bag carry? A DSLR body and up to three lenses, plus an external flash. It also has dedicated pockets for memory and business cards and can easily accomodate a tablet and your mobile phone. It comes in three colours of Poppy Red, Muted Mustard and Dusty Grey for $159. The Lisbon bag is made from cotton canvas with faux leather trim, and is the preppy sophisticate of the Lei Momi range. In four fabulous colours (one limited edition $189), the Lisbon has five dividers and a crossbody strap as a well as shoulder straps. 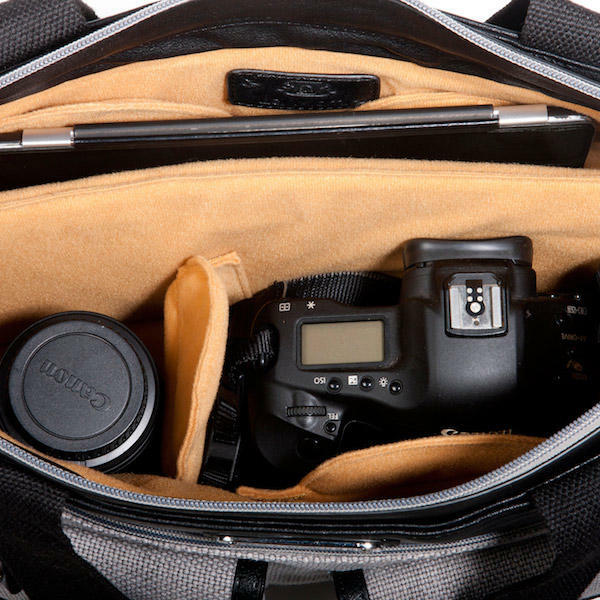 This bag is the larger of the two and can house a large DSLR body and up to four lenses, as well as a 13-inch laptop. It’s $159, with the limited edition $189. Delivery within Australia is a flat rate of $12 so get a bunch of photography-obsessed friends together for an order from Lei Momi.